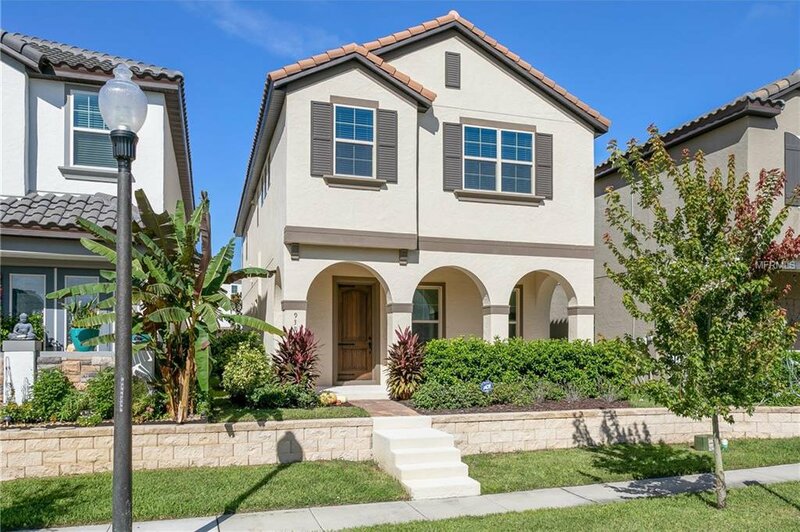 You will love this beautifully upgraded 3 bed, 2.5 bath, 2 car garage home located in the popular Watermark community in Winter Garden. Special highlights include an open floor plan, wood-look tile in the entertaining spaces, tile roof, six solar panels for energy efficiency and tons of natural light! The kitchen is the star of the home with a generous center island featuring quartz counters, custom cabinetry, stainless steel appliances and views of the dining and family room. This layout provides as much privacy or entertaining space as desired! Keep the upstairs bedrooms private while entertaining friends and family downstairs. The large owner’s suite is a sweet retreat at the end of the day with room for a sitting area, TWO walk-in closets, dual vanities with stone counters, and a perfectly tiled stand-up shower. Upstairs also provides a generous flex room, perfect for a movie room or just a space to get away at the end of the day and relax on the couch. Watermark is a beautiful master planned community with a resort-like pool, sports courts, playground, clubhouse and gym, and tons of sidewalks for walking, biking and taking the night time stroll to watch the theme park fireworks. This community is also zoned for A-rated Independence Elementary School & Avalon Middle school and the new Windermere High School. Just minutes to local shopping and restaurants, and right around the corner to Disney, you will love living in the center of it all. Call today for your private showing. Listing courtesy of CREEGAN PROPERTY GROUP. Selling Office: KELLER WILLIAMS CLASSIC REALTY.